Dillon’s practice has involved a wide range of legal issues from commercial real estate, finance and international business transactions and now civil litigation work including business litigation, employment disputes and medical malpractice. 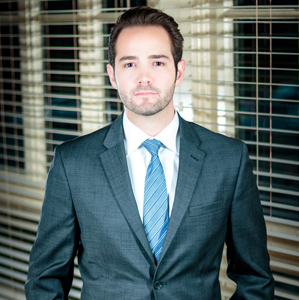 Proficient in Spanish, Dillon graduated from the University of Kentucky College of Law, the Patterson School of Diplomacy and International Commerce, and the University of Southern California. Prior to his legal career, Dillon sought diverse professional experiences. After graduating from college, he orchestrated his own volunteering experience in southern Peru with a small non-profit organization. Later he gained valuable professional experience as part of a U.S. Senate campaign, and after that he joined the public policy team at Greater Louisville, Inc., Louisville's Chamber of Commerce affiliate. Prior to law school, Dillon embarked on a month long excursion with the Northern Outdoor Leadership School in Alaska, which taught him the value of sustainability and of protecting the environment. Throughout his schooling, in his extra curricular activities and now in his professional career, Dillon has been immensely curious in his work, with a deep appreciation for the world around him.